By symbolically adopting a raptor and becoming a sponsor, you will enable the Project to make additional improvements on the holding and training facilities, provide the best food for the birds, and purchase new handling equipment. 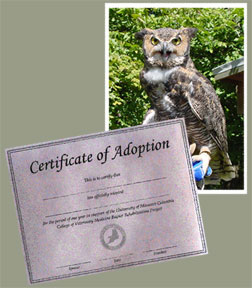 As a bird’s sponsor, you will receive a certificate of adoption, a picture and history of the adopted bird, and an invitation to our annual picnic at our facility. Adoptions make wonderful educational gifts for classrooms, children, and wildlife enthusiasts.